As we come to the 10th year of camp, we are called to gather ourselves at the foot of the World Tree, whose roots reach deep into the Well of Destiny to weave the current of life. The Tree offers us the opportunity to reflect upon, integrate and transform our collective stories through the immersive, non-linear frame of Whole Time. In Whole Time, the past and the future are not separated by hard boundaries… from the present we may dissolve what seems to keep us isolated from the myriad aspects of our whole selves – as individuals, as a community, as a species and as a small but significant piece of a much greater whole. We, the Theme and Story working group, would like to acknowledge that many cultures in many different places throughout time (in whole time if you will) have had myths and stories of a world tree. In crafting this theme and story, we have been particularly inspired by Norse mythology,* partly through affinity for some of us and familiarity for others. We have endeavored to craft a unique story that draws on these sources yet is our own and has sprung out of our cultural context and time. This theme and story hopefully honors all world trees. *We have have decided to keep the Norns as part of the story. This has been part of long conversation and exploration of tensions that we have had and hope is far from over. Some of those conversations/tensions have been about tradition, appropriation, our relationships with/as the divine, and the place we have in mythology. What Trees are we of, and what threats do we face? Through twisted, rich and dripping webs, the World Tree has sent word for us to come, come, come. In myriad ways, through dreams, intuition, senses, stories from our elders, cries from our kin – the message is undeniable: The World Tree is threatened. We have heard stories of the distant past – of the old life in right relationship, when the people gathered water from the Well of Destiny. We knew of stories of the peoples the world over who have fought to save their World Trees. We awoke to the call of the World Tree. ln the light of the waning moon, we drank the water from the Well of Destiny. We fell into deep vision, time slowed and sped simultaneously, we sank into the earth and followed the flow of underground water to the Well. In our journey we heard voices of earth, trees, rocks, animals, asking: Where are we coming from? Who/what do we bring with us? What is in the Well of Destiny, memory, blood, ancestries that we are drawing upon? What is our relationship to the World Tree of the place we are coming from? What is the threat it and we are facing? What are the questions we are hoping to answer by embarking upon this journey? What do we risk by leaving our “home”? We awoke among the giant and soft roots of the most beautiful tree we have ever seen. Where and what and who are we in this web of relations? The Tree is so many beings: epiphytes, mycelia, lichens and mosses, squirrels in the branches, ants in the trunk, nests of bat and bird and bee. The dancing dark waters of the Well of Destiny surround and pulse with the Tree’s roots. Gorgeous intricate bark leads out to golden-green leaves shimmering in the sun. Standing with this ancient nexus of the great web of life, we see more clearly how our own complex webs are spun around us, and how intricately connected they are to this tree. When we move in closer we notice there are cracks, dark splits running down the big branches to the trunk – not on all of them, but many. And here and there we see the naked inner flesh of the tree where branches must have fallen recently. The Tree is sick. And in this sickness we also see ourselves. The pain of disconnection from this deeper flow of life, how over the past generations more and more has been threatened, then devastated, then lost. We feel the fear of what will happen if the World Tree isn’t healed and the grief of all that has already been swept away into the endless night of extinction. As we lean in close, closer, closer, we hear the Tree asking: Where have we come to? Who are we in relation to this place? What are the impacts of our being here? Who are the beings who call this place home and what is our relationship to them? How can we communicate? What are the barriers to communication? What don’t we understand about this place and these beings? What have we come offering? What do we hope to get? We try to understand what the Tree is telling us – what it needs. We feel a strong desire to learn the language of this being so that we can do something – anything – to help restore balance and equilibrium. What do we need to sacrifice to be more deeply in right relationship? The Tree makes space for us to sit, leaning up against her massive trunk, the waters of the Well of Destiny flowing over our feet and feeding her roots. Although we have come looking for answers or following a feeling we have not been able to name, we are greeted with silence. We sit in this silence, until it sinks into us and moves and swirls all that has become hardened and ill.
From the silence and from the Well arise three Norns/deities, weaving between them thin strands of watertime: past into present into future which becomes past again. As the Norns’ fingers silently play the dance of Whole Time, we fall into their hands. One spins the thread of time, and into the silence come questions more felt than heard: What do we need to know about the World Tree? How is Whole Time essential to our understanding? One weaves the thread into the tapestry of life: How can we open up to our wild, animal, plant, mineral, elemental selves in order to be truly receptive to what the world Tree is teaching us? One cuts the thread and the water drops fall tinkling back to the Well: What do we need to let go of in order to come into right relationship with the World Tree? What are we willing to sacrifice in order to understand more fully? As we feel ourselves spun and unraveled by the hands of the Norns, our histories and futures water-woven through the whole of Time, we dissolve into the Well and are drawn up into the Tree. What mutual aids do we offer and ask for? The Tree dances and throbs around us: our liquefied bones pulse with her blood. We are woven through every part of her, and only now can we begin to better hear her voice in our innermost hearts: What must we do to restore the Tree? How can we move towards allyship with the struggles of this place? The blazing sun feeds the World Tree and we feel a rising fire in our bellies. 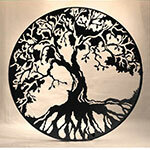 Firmly rooted in the Well of Destiny, the Tree spans all of time and space. She shows us uncountable others, whose journeys mirror our own. Each being comes seeking their own answers, with their own stories. To whom can we offer solidarity? Do we have something we can offer to someone else’s journey or struggle? To whom may we be guides? As each becomes aware of the others, we realize that we have more than just questions. Every one of us has guidance and allyship to offer. In this solidarity, through the World Tree, we are bound together. What support do we need and what can we do to reciprocate that support? What do we commit to do? The World Tree carries us up into her highest branches, where we may see paths toward wholeness spiraling out from this present moment. From so high, we can see distant lands and times – maybe even the future of this land? We see that the World Tree is flowering, releasing pollen and seeds into the wind which carries them far beyond this place. We feel her roots, pulsing still through the very subterranean webs which called us to her, which weave the world over to the beat of Whole Time.